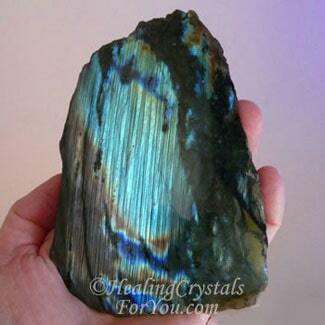 Labradorite Crystal Meaning & Use: Want To Awaken Your Magical Powers? Want To Awaken Your Magical Powers? Labradorite Crystal is a stone of magic, awakening within you mystical and magical abilities and psychic powers. They embody within them a deeply felt resonance that is very powerful. They can be used to bring amazing changes to your life and their vibration also holds a broad level of protection from negativity, so they cannot be used for ill will. These crystals have many attributes that make them crystals that many people might choose to use. This is a stone whose energy is quite visible to the user, as it just seems to work so quickly. 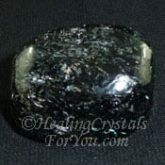 Some of their well known attributes include their action to boost your spiritual gifts, and to enhance psychic abilities, and they also have many excellent healing properties. They are chakra stones for the chakras above the heart, including the throat, third eye, crown and soul star chakra, and they resonate strongly within all of these chakras. 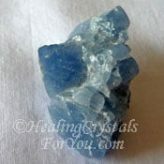 They are powerful healing crystals for you to use to stimulate an increase in coincidence and synchronicity, and they are well known for their action to boost psychic gifts. 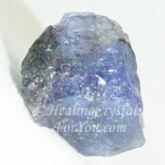 This is because within the throat chakra they stimulate stronger psychic communication abilities and within the third eye chakra they work to enhance both telepathic and prophetic gifts. Wearing a piece of this stone just seems to charge you with a sense of excitement and adventure, to take the steps required to go where you have not gone before! The Finnish variety is called Spectrolite, and is slightly different as it exhibits the full range of colors. 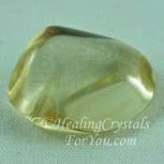 There is a clear yellow variety called Golden Yellow Labradorite and although it is commonly known by this name, it does not exhibit any of the play of colors common to others in the family. The yellowish stone that does have labradorescence is quite unusual and may be called Gold Flash or Fire Labradorite, and is available as jewelry that is very beautiful and quite unusual. The most common colors that this crystal comes is usually blue, blue-green, lavender-blue, or yellowish, and can even be pink or purple. They commonly display a mixture of these colors within the stone, with the beautiful labradorescence or light play of amazing colors throughout these stones. Why Would You Use Labradorite? Labradorite Crystal has a number of interesting metaphysical properties, including its action to protect your aura, and to clear negativity from it, and it seals it to prevent any energy leaks. If you have been doing too much and need a recharge, it will give energy to you. If you have been working on your spiritual growth, this is a stone that will boost your abilities within the chakras above the heart chakra. Are you wondering if you have any psychic abilities? 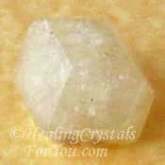 You may learn how to be psychic once you begin to use this crystal as it has a good action to boost new gifts including mental telepathy. If you are not quite sure how to start the process to develop them you may find that any gifts that are waiting to develop may begin to manifest, as you make better connections to Spirit. 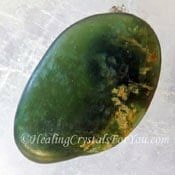 This is a highly spiritual stone, that aids you to move more easily within the higher realms of existence, to pierce the veil between the spirit world and your normal world. It has a strong action within the higher chakras, and it is an extremely potent crystal if used at the third eye chakra in meditation. This includes the mental, intuitive, psychic as well as the magical or mystical, and inspires your thinking to embrace this coherent whole. In the past Labradorite Crystal was known as a stone of magic, because it was clear that those who used it had access to a range of abilities that seemed almost magical. 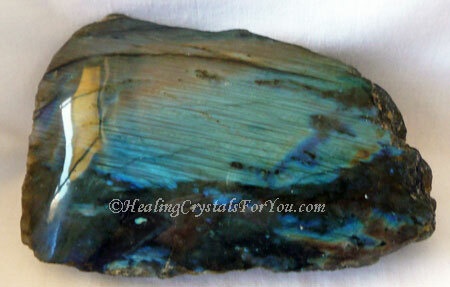 What are the magical properties of Labradorite? It's vibration has always been thought to be magical as it stimulates many psychic gifts as well as increasing the occurrence of synchronicity. 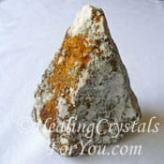 The energy of this beautiful stone brings you the gift of serendipity and synchronicity. These two things combined can cause amazing things happen in your life. Those little coincidences, where you are in the right place at just the right time, seem to be quite magical as they occur more often once you begin to use this stone. Wearing Labradorite Crystal jewelry is a powerful way to use this stone. To enhance the possibilities inherent in the stone, keep it as high as possible on your body. Having it within your aura will stimulate the birth of many psychic gifts. These lovely crystals are a Scorpio, Leo and Sagittarius birthstone, and it is possible to buy jewelry made from this stone quite easily. 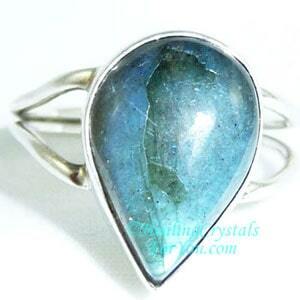 Wearing a Labradorite ring may be beneficial if you are a healer who uses your hands to send energy. If you are a Reiki practitioner, it will boost the sending of energy from your hands. Wearing a piece of this stone like the lovely earrings shown in the image at the top of the page, may stimulate the development of the gift of psychic hearing. This psychic gift is commonly known as clairaudience. 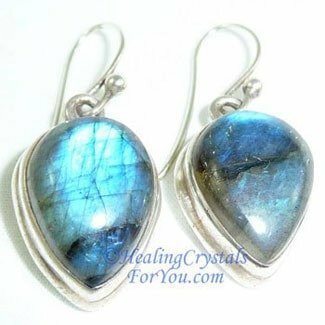 Lovely Labradorite earrings are beneficial crystals to wear, as this stones energy will also help you to develop telepathic and prophetic gifts. This is because these gifts are birthed from within both the throat chakra and the third eye chakra, so having them present in that area for periods of time will be stimulating to both of those chakras. 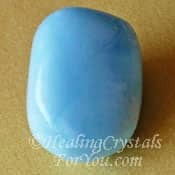 These stunning stones are on the zodiac birthstones list and its easy to get jewelry made from this stone. 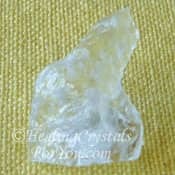 This is a crystal whose energy is quite obvious to the user, as it just seems to work so quickly. 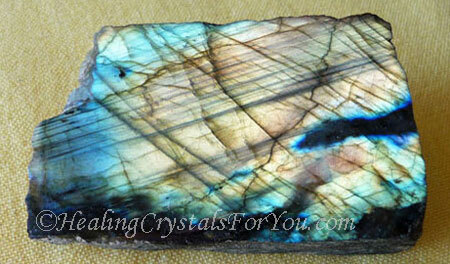 It is easy to buy Labradorite Crystal and you may utilize it in a range of different ways to improve your life. By its use you may quickly move your development forward. It will enhance the connection between your physical and ethereal beings. You may choose to place a piece under your pillow at night. 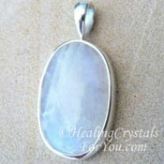 This allows its energy to be present within your aura for an extended period of time each day. An alternative is to wear Labradorite jewelry, and this is a quite lovely stone that also makes beautiful pendants, rings and earrings. As you open your crown chakra and allow direct contact with the Divine Mind, you will begin to be aware that you are getting direct messages from Spirit. Wearing Labradorite Crystal, such as lovely crystal jewelry helps you to understand your destiny, that path that you chose before you came here to the earth plane. 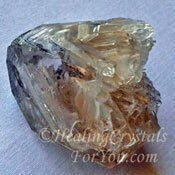 This crystal aids serendipity, coincidence and synchronicity to flow in your life. It also aids you to let go of thoughts that may impede you from taking action on those things that you are inspired to do. Yet by its strength of fostering a more patient attitude, it allows you to recognize within the intuitive thoughts received what the correct timing is for taking action. If you have been working on ways to develop your intuitive abilities, by adding Labradorite Crystal you may be empowered to transform the intuitive messages you receive into clear thoughts. It will assist you to make contact with beings from other dimensions that may assist your journey, and allow you to get done those things that are important in your journey. An easy way to help you to develop the gift of automatic writing, is to write in a journal every day. Once this gift becomes stronger, the thoughts you pick up will start to clearly provide guidance. This information you receive may allow you to more easily take action, in alignment with Divine inspiration. Do this daily writing while either wearing this crystal or keeping it close by. This energy will assist you to more easily receive written communication directly from spirit, you may also find that you experience the gift of claircognizance or psychic knowing. Wearing jewelry made from this stone such as a lovely Labradorite Crystal pendant, ring or earrings, is a good way to utilize this stone. 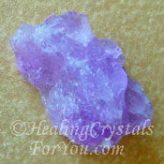 Having it present within the aura will enhance psychic gifts, such as clairvoyant abilities or psychic vision, and may aid you to make contact with your spirit guides. Its energy resonates strongly within the crown chakra and the soul star chakra, and it encourages you to make contact with the Divine mind. It may particularly help you if you have it on your body while you are doing a meditation to boost psychic gifts. 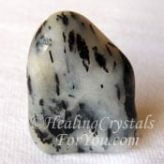 Whether you wear it or keep a piece nearby, its vibration will help you to achieve your desired outcome if you wish to develop psychic gifts, so you can see why this is such a beneficial stone to have in your life. 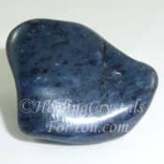 It is an excellent stone to wear on the body, as it will enhance the development of many of the psychic powers, and it is quite effective at stimulating these energies into awakening. Keep a piece of this stone in your pocket, or for the ladies in your bra, or wear it as jewelry. 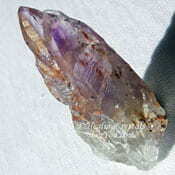 To generally boost abilities in the psychic fields, keep this crystal in the center of your body. In the process it may aid you with contacting your spirit guides. It is effective to wear a piece of jewelry made from this stone, if you can find one you like. Labradorite crystal is easy to buy, so its easy to ensure that you have piece of the stone within your aura if you wish to take advantage of its energy. 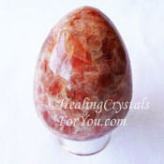 Natural crystals of this stone are the highly effective if you wear them at the throat, and it embodies within it psychic protection energy, to render you safe from harm as you take spiritual journeys. 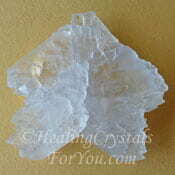 They are beneficial healing crystals for you to use, with a number of useful healing properties. Their energy may be helpful to aid those with gout symptoms, and may also help to relieve pain. Its action in the brain not only stimulates your mental abilities, but also helps with the healing of disorders within the area of the brain, and it is said help your metabolism and digestion. 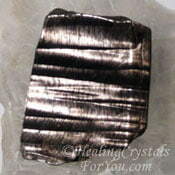 The energy of this stone aids the healing of a number of health problems. It is also known to be a useful treatment for PMT and it is said to help to balance your hormones. It is advantageous if you are a healer to keep a piece on your body, as having it within your aura can be valuable. 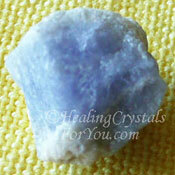 This stone has a lovely energy, and using it is one of the methods to relieve stress. 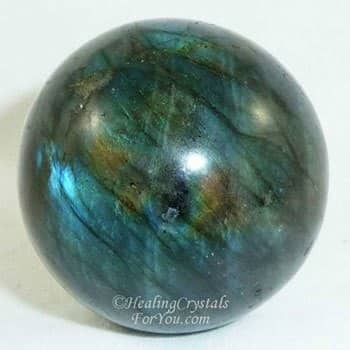 Other Labradorite properties that aid healing include its action to help other health issues such as respiratory complaints, including bronchitis and to help alleviate the symptoms of colds. "Magic is believing in yourself, if you can do that you can make anything happen." Johann Wolfgang von Goethe. Sonia Choquette books are excellent aids to help you if you are working on developing psychic gifts, including your intuition, a closely related ability. 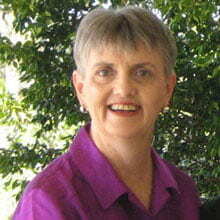 I particularly liked the information she shares in her book "Ask Your Guides". It is an excellent book to assist you to find your spirit guide. You can read the story of how Sonia developed her particular gifts, and how to develop your abilities, in her book 'Diary of a Psychic'. To read reviews of Sonia Choquette's books Click Here. 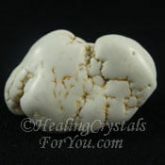 For specifically aiding you to develop clear psychic visionary abilities, combine it with Magnesite or Gabbro, also known as Blizzard Stone. It's energy blends well with its sister stone Golden Yellow Labradorite as well as with all colors of Moonstone. 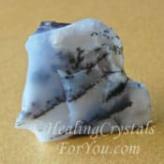 The lovely Rainbow Moonstone, the stone of the Divine feminine, is excellent to use with this crystal. 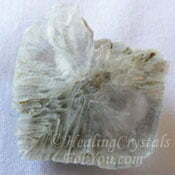 Combined with this crystal, it is very powerful for women who are feeling emotionally unbalanced. 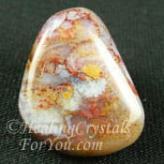 Its energy is harmonious with Merlinite, Spectrolite, Nuummite, Pietersite and Sunstones. 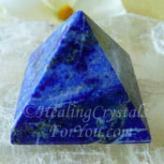 If you are working on developing any psychic abilities, Lapis Lazuli, Shattuckite, Iolite stones and Dumortierite combine well with this stone to enhance these gifts. 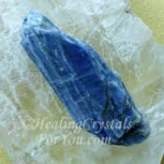 This crystal will benefit Reiki practitioners by helping to increase the level of energy you are sending from your hands. If you would like to boost it even more, use it with other crystals that also aid the flow of reiki energy, such as Pollucite, Tunellite, Blue Aragonite, Fenster Quartz, Ascension Stones or Lepidocrocite. To boost your telepathic gifts, you may choose to combine it with Petalite, Amethyst Cacoxenite, Afghanite, Eudialyte, Blue Kyanite, Rhodizite, Blue Calcite or Selenite. 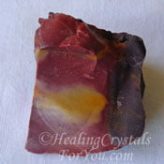 Use with Mookaite Jasper or Hackmanite to aid you to develop your intuition. 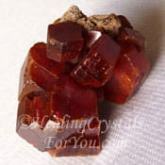 Use it in meditation with Vanadinite, to aid you to get answers about how to utilize your psychic gifts. 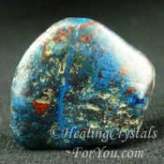 This is a stone that combines well with any of the crown chakra, third eye chakra and throat chakra stones, including other magical or mystical stones such as Chalcopyrite, Hypersthene and Bowenite.